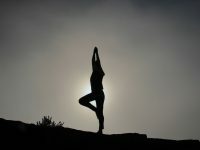 Some see yoga as a way to calm the mind, relax the body and reconnect to what is important in life. Others see it as a sweat-soaked workout of nearly impossible poses with silly names. But Muslim groups in India are concerned that yoga, and especially the celebration of International Yoga Day on June 21 and compulsory yoga instruction in schools, contradicts the teachings of Islam. Objections to yoga because of a connection to religion are not isolated to India. Recently, a California couple appealed to the US Court against their child’s school for teaching yoga in gym class. They said that the connection to Hinduism would impede the child’s pursuit of a Christian lifestyle. Similarly, in Ireland, a Catholic priest made headlines by warning that practicing yoga could lead to the “Kingdom of Darkness” and ultimately, Satanism. Despite these cases, the practice of yoga is widespread and celebrated in the West. Yoga mats are spread in grassy areas of parks, and classes, if not entire business, are devoted to learning the many poses and chants that make up the yogic tradition.